OK, I admit defeat…new plates, heavy spring, & the standard Moto Parilla clutch still slips, is hard to disengage & drags. 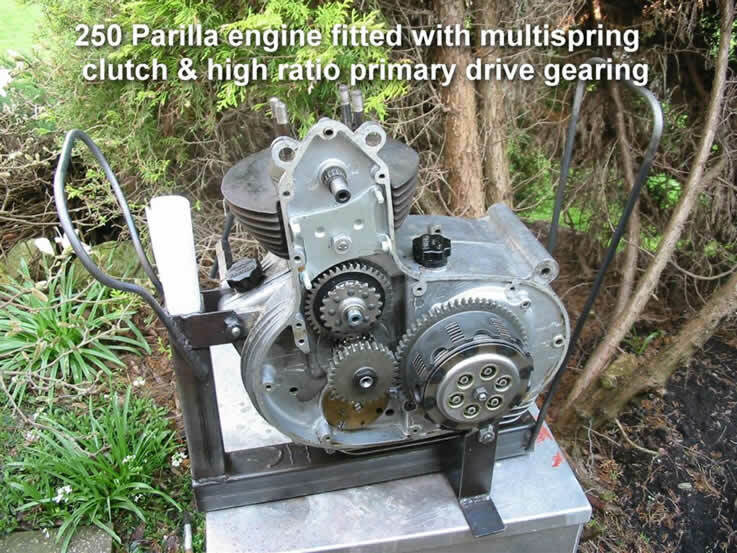 Let’s face it it was designed for an engine producing less than 5 HP & Parillas idea of an upgrade was to increase plate diameter by 5mm & stick an extra plate or two in there for good measure. If you have a 175 or 250 engine with some performance upgrades – X1 cam, HC piston & better breathing – it’s going to be a pain with a standard clutch. That’s not just my opinion either. 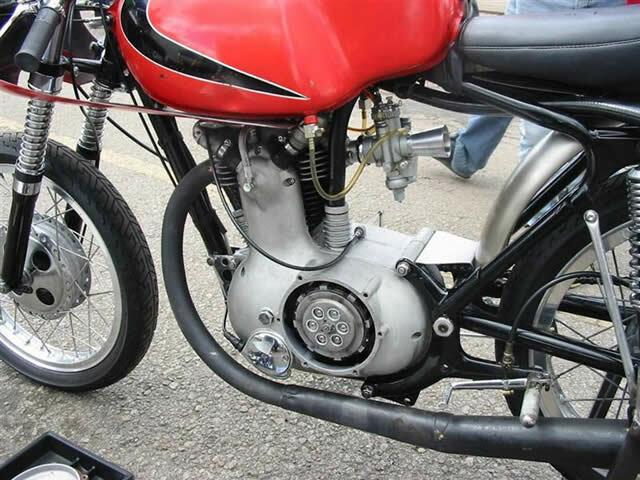 The Moto Parilla race shop fitted Ducati style multi spring clutches to Richard Morley’s race bikes back in 1964. We’ve been rebuilding RM’s old race bike & putting together another race engine or two & have managed to get Nova engineering here in the UK to produce what is basically a Nova Ducati racing clutch to fit onto a Parilla Hicam gearbox mainshaft. The unit consists of a new primary drive – crank gear, alloy clutch drum & steel gear, alloy clutch centre & bearing, fixing nut & washers. 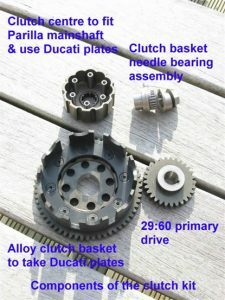 You need to provide a set of Ducati single clutch plates, pressure plate & adjuster, springs, cups & tensioning screws plus make a new clutch pushrod from 5mm silver steel. 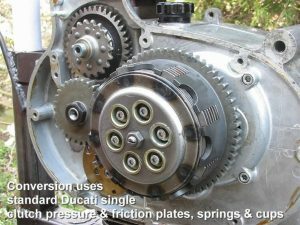 This clutch unit is fitted to 450 racing Ducati singles & has proven to be up to the job for several seasons. We have tested the unit on my Parilla MSDS & RM’s 250 race bike – it’s a joy to use. Light in action, easy to disengage with no trace of slip or grab.